New buildings can be protected from termites with one treatment of natural, non-toxic; Granitgard graded stone physical termite barrier material. This treatment is easily applied during construction and could save the building from destruction. With a wide range of simple installation methods that are fully approved, Granitgard can protect all common building designs. Granitgard offers long-life, one system termite protection without the worry of toxic chemicals, building schedule delays and on-going retreatment’s. Because Granitgard remains visible it is easy to determine whether an area has been properly protected. Granitgards flexibility means that it will remain effective when the buildings’ service connections, footings, foundations and walls expand and contract. Granitgard allows building components to move independently without breaking the termite barrier or cracking walls, footings and pipes. The specially graded and shaped Granitgard stone particles are used in combination with durable termite resistant strip shielding materials to provide a flexible, non-toxic, long-life termite barrier. This barrier protects buildings by blocking concealed termite access and forcing those termites that are trying to enter the building out into the open where they are visible and can be easily eradicated. 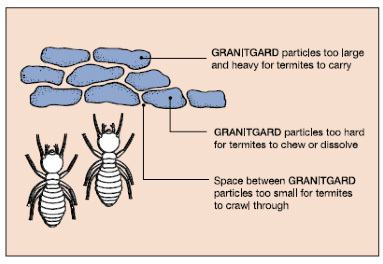 Granitgard termite barriers do not require replenishment or repairs unless the barrier has been disturbed, during renovations or plumbing repairs, for example. In situations such as these, contaminated graded stone should be removed and the barrier topped up to the appropriate level with fresh stone. This work should only be performed by a licensed Granitgard Installer. Termite shielding may also need to be repaired after renovations or plumbing work. Again this is a simple process that can be carried out by a licensed Granitgard Installer who will issue a new Granitgard Treatment Certificate and Warranty to cover the new work and repairs. The natural stone material used to make Granitgard is a by-product of concrete and road sealing aggregate crushing. That portion of quarry output which is too fine for other products is re-processed to make Granitgard. Crushing, screening, vacuuming, packaging and delivering the volume of Granitgard required to treat one home uses very little energy and has low environmental impact. There are no chemicals added to Granitgard. Installing Granitgard in a building actually reduces that structure’s energy demand because Granitgard also helps to insulate the underside and perimeter of concrete slabs. A 100 mm layer of Granitgard has an “R” value of 0.6. Being a once-only treatment the efficiencies of Granitgard termite barriers multiply over time as other systems require re-application or replenishment. The strip shielding materials used as part of the Granitgard System are manufactured. PVC strip shielding is made using some recycled plastics. Like the Granitgard graded stone, strip shielding can be re-used. Granitgard Pty Ltd’s research and development efforts, in collaboration with the CSIRO, continue to refine sustainable termite protection techniques to better meet the requirements of architects, engineers and builders. Investigations into the use of lower impact recycled materials for Granitgard strip shielding and penetration collars are examples of the company’s innovative approach. Such innovation and flexibility ensures that Granitgard continues to be the responsible choice for termite protection.